Prairie Hills Gelbvieh was started in 1985 by Galen and Marcia Sickler with the purchase of two heifers from the Black Hills Stock Show. Later that spring more heifers were purchased from Taucks Gelbvieh and cows from Weber Gelbvieh. We have always tried to have a combination of performance with style. With that in mind DBC Grizzly Bear was purchased in Denver. 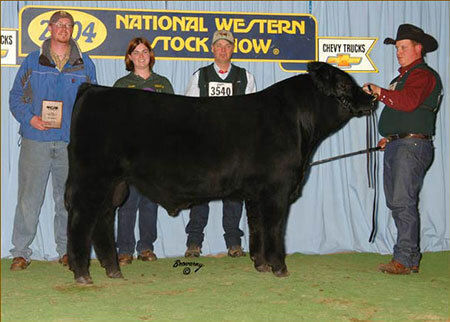 He was one of the first polled show bulls in the breed with high performance. Later TAU Issac was added to the herd bull battery. He became a trait leader in yearling and weaning weight. Over the years, many of our goals and selections have remained the same with some changes being made to fit our environment and the changes in the beef industry. We still select for easy fleshing, thick cattle that are structurally sound and can adapt to our dry range conditions. With the fluctuations in the cattle market, only 1 constant remains – pounds pay! Performance is a must, but on a moderate framed animal. These are the traits that give us the type of cattle we are raising today. Herd bulls like DVE Davidson Payday, RWG Why Me, COLB Mr. Xavier, NGC X Rated, and RWG Xtreme are giving us the type of calves that come easy, yet wean off over 800 pounds. In 2007 we welcomed our son Klint and his wife Maralee Sickler to the ranch. Their purchase of the original homestead has allowed us to expand the cow herd and take our program to the next level. We pride ourselves on producing cattle that meet the needs of commercial cattlemen and seedstock producers, while providing outcross genetics in an eye appealing package.